Is this shirt great enough to justify me spending any money at all on it? I think so! 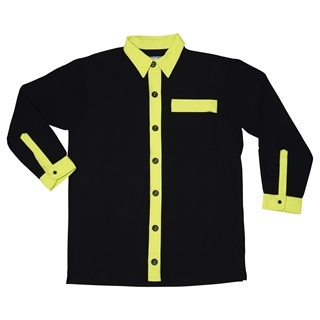 This shirt is stylish and cool to the max!! The resolution of a computer screen or smart telephone liquid crystal display panel cannot adequately capture the quality of the buttons and fabric that make up this shirt. This shirt has to be seen in person to be truly appreciated! Let’s start with the buttons. The buttons on this shirt are different than the buttons on other color variations for the All Occasion men’s dress shirt line. Each style of the All Occasions shirts has its own type of buttons. All of our buttons are sourced out of Germany and are still marketed primarily to the hobby sewing sector. The buttons used here are of a higher quality and price than what is typical for manufactured dress shirts. The fabric used here is 100% Kona cotton. Kona cotton is a patented and trademarked type of cotton fabric initially designed for the quilting market. Kona cotton is made by first selecting a high grade of cotton fiber and then weaving this fiber into a fabric with an unusually high thread count and tight weave. Kona cotton has an unusual strength and durability compared to cotton fabrics of the same weight. In addition to being exceptionally strong and durable Kona cotton is made with mindfulness concerning toxicity and allergenic issues when the fabric dyes are chosen. Kona cotton is made with the least toxic dyes possible. Kona cotton is approved for use as bedding for babies. Low quality fabrics colored by toxic cheap dyes slowly poison people wearing articles of clothing made with these textiles. Toxically colored textiles eventually end up in landfills leaching toxins into local ground water and slowly poisoning the entire local ecosystem. Kona cotton is great for those with allergies or skin sensitivities. The wholesale cost of Kona cotton fabric to make one shirt like this one is about the same as the cost of a cheap men’s button up shirt sold at a big box retailer. It is best to think of this shirt as a long term wardrobe addition. In addition to looking stylish and cool this shirt is made in the USA. We at Quantum Cat Designs have made a commitment to keeping final assembly in the USA to help support American Industry and provide jobs for Americans. Yes indeed, America is still classified as a high income nation by economists, however; there are still no shortage of Americans struggling financially at this time who would value your support. Style Points: Stylistically this shirt has a cactus shade of green for trim. This color is meant to invoke images of the Southwest, hence the name Cactus Jack. I chose a cool set of buttons with cactus images to compliment the color scheme. This shirt is a great casual and cool article of clothing. This design is great for office work and generates a great subdued vibe for relaxing dining outings and a calming vibe for business meetings.